Most people worry that when they are out there in the wilderness enjoying those unspoiled fringes of nature, they might end up missing out on their usual array of well-cooked delicacies. Undoubtedly this would’ve been true at one time but these days, with the help of backpacking stoves, you can enjoy pretty much any meal even when you are camping in the middle of nowhere. 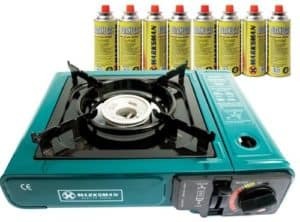 A well chosen gas or electric camping stove should be high up on your list of priorities when putting together the equipment for your expedition or holiday. In fact, these days the number of options to choose from can be a little mind-boggling – how much should you pay? What kind of fuel? Who makes the best stoves and which should you avoid? As a consumer, it’s always worth looking for the best deal. 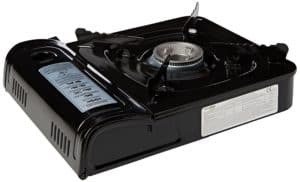 We’ve tried to make this task easier for you by listing what we consider the the best camping stoves available this year. Our list of the top 10 particularly takes into account the portability of the stove, their functionality, safety features and ease of use. 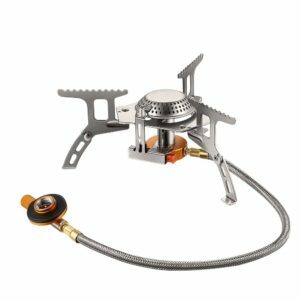 If you’re looking for something even more portable, this burner stove is the perfect option for you. It also incorporates the Piezo ignition and its small size ensures that you are able to carry it pretty much anywhere you might want to take it. The energy efficiency is such that it will be able to boil water within 3 minutes; impressive for such a wee tool. Since it is made from aluminum alloy and stainless steel, it’s a hardy stove that’ll take a decent amount of punishment and remain in good working order. Flared up unexpectedly at times when first lit, worth watching out for. We’ve all ended up camping or hiking in windy conditions where a fragile gas flame just isn’t going to last the course – you need more advanced protection! This stove is an excellent solution for that scenario, with tall sides that protect the flame. The stove is made of few parts and is a doddle to assemble, ensuring that you are able to set it up within a few minutes. Do bear in mind that this is a stove intended for wood fuel, so should only be used in regions where that is a viable resource. It does allow for alcohol fuel as a backup, but we wouldn’t rely on this purely as an alcohol stove. An excellent thing about this particular portable stove is that it comes with a good quality carrying case. This ensures that when not in use, you can keep it dry and safe from clattering around. 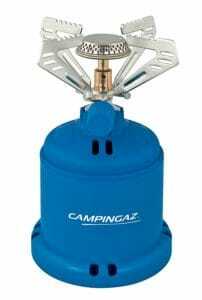 In general it’s a tidy little stove ideal for use in a confined space. 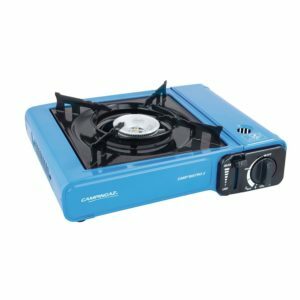 This is another economical gas stove and seemed to kick out a hotter flame than most others that we tested, cooking our breakfast in a very agreeable time. With the help of Piezo ignition, it ignites at the press of a button and operation was quick, reliable and foolproof. Spark igniter took a few goes to get going. This portable stove is powered by gas. When we purchased this stove it came with 8 butane bottles at a very reasonable price. This was plenty of gas for several trips, which made it an excellent buy for someone on a tight budget. It has a safety shut-off feature which helps you in protecting yourself from any flares or other such problems. Also, in addition to that, the flame height can be easily adjusted. 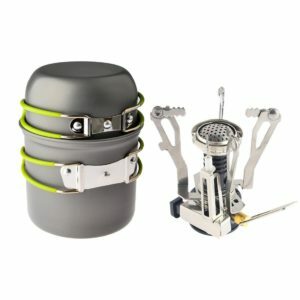 All in all, this is a very solid option if you’re looking for a stove to grab before you set off backpacking. 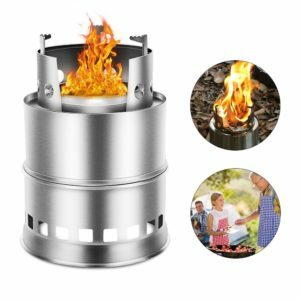 If you’re looking for a more elaborate portable stove, this one also boasts a very usable grill. We found that the 1.5 KW burners kicked out enough heat that this improved the range of meals we were able to consider when out on the trail. 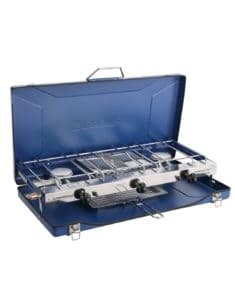 The grill’s briefcase-type construction ensures that it’s easily carried and that the internal gubbins are well protected. We were pleased with the reliability of ignition and the speed of cooking. 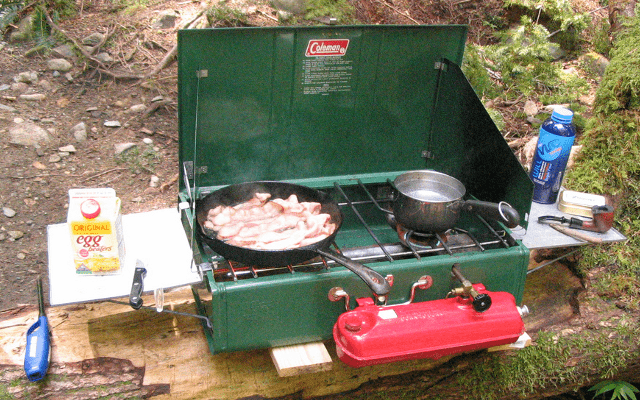 This would be an excellent stove for a couple or small group. Shouldn’t be heavily loaded as the build quality isn’t exceptional. A good quality alcohol and wood-fueled stove. As with the other wood stoves on this list we’d recommend that you not rely simply on alcohol to get this going. Owing to the stainless steel construction, this is a sturdy package though it does scratch rather easily. Despite the slightly awkward shape it is easier to carry due to a useful mesh bag. The compact size is another added advantage. We all prefer a stove which can be easily ignited and which is perfectly safe for use. This stove meets those needs perfectly. It is lightweight and highly portable. Moreover, it has a safety locking feature which ensures that the gas canister isn’t easily dislodged. The automatic ignition was reliable and the flame highly adjustable. This is a solid stove which is likely to include all the features which you’d be looking for when preparing your al fresco bacon sandwiches. An excellent option for a stove with high fuel capacity. It lasts for around 2 hours on a single cartridge. This gas stove ignites easily and was capable of boiling fresh water in around 7 minutes during our testing process. At just 280g this is an extremely lightweight stove that will serve you well on your outdoor adventures. Balancing the gas bottle on uneven ground can be a trial. This is another stove that is available cheaply with 8 included gas bottles, ensuring that with one puchase you’ve got plenty of hot meals in your near future. The safety shut off on this stove is well-designed and reliably shut off when left open during our tests. 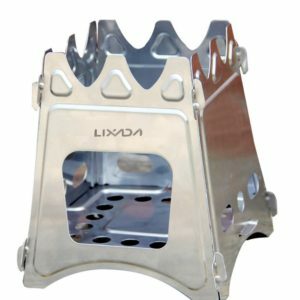 This is another lightweight and efficient stove that we’d recommend for a single person or couple during a short trek. 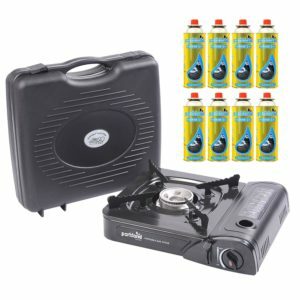 Available with up to 8 gas bottles included. Comes with a pretty poor carrying case with very little protection. Packaging doesn’t come with instructions. So if you’re going out rambling and want yourself a hot dinner we’d consider these to be the most reliable, safe and easy to use stoves out there. Enjoy yourself out there!